California is located on the West Coast of the United States. The weather is superb throughout the year, but conditions vary north to south. Southern California is home to such popular attractions as Disneyland, Hollywood and the beaches of Malibu, while northern California offers the iconic Golden Gate Bridge, the hills of San Francisco, the vineyards of Napa Valley, and the capital city, Sacramento. California’s major cities include: Los Angeles (the second largest city in the United States), San Diego, San Jose, San Francisco, Fresno, Sacramento and more. California is also home to many beautiful National Parks: Yosemite, Death Valley, Joshua Tree and Sequoia are just a few examples. As the state’s attractions are quite spread out, you will definitely need to rent a car to explore most of it. For more information, see the California cultural guide below or visit visitcalifornia.com. Also see our custom Google maps for things to do and see in San Diego and San Francisco. George C. Page Museum at the La Brea Tar Pits in Los Angeles. Photo by WolfmanSF. The Donner Memorial State Park in Truckee has several historic sites, including the Emigrant Trail Museum, Pioneer Monument and the Donner Party’s Murphy family cabin. Visitors will also enjoy hiking trails, cross-country and snowshoe trails and other outdoor activities. Visit the California Department of Parks and Recreation website for more information on the park and its history. The Gatekeeper’s Museum tells the story of Tahoe’s history, including the Washoe Native American tribe and the mining and logging history of the area. Find out more about this museum at the North Lake Tahoe Historical Society website. Vikingsholm Castle on Emerald Bay in Lake Tahoe is a former summer house that now serves as an example of Scandinavian architecture. Visitors can hike down to the “castle” at any time of the year to enjoy the beautiful views of the lake but tours of the house are only available during summer months. Take a cruise of Lake Tahoe on a paddlewheeler boat tour from Zephyr Cove. Sierra Nevada Geotourism is a web project to showcase events and destinations in the Tahoe area and throughout California and Nevada. To see a map of top attractions and places to visit in Tahoe and to learn more about the project, visit the Sierra Nevada Geotourism website. Browse a list of cultural and historic sites in Lake Tahoe and Truckee. Tahoe Adventure Company offers many tours of the Tahoe area, including mountain biking, kayaking, hiking and snowshoeing tours under the stars or the full moon with a professional astronomer. Lake cruises are available on the Tahoe Gal in North Lake Tahoe, including daily brunch, dinner and happy hour cruises and specialty cruises, like a full moon cruise or magician cruise. Try a sleigh or carriage ride with the Borges family in South Lake Tahoe. For tour information and pricing, visit the Sleigh Ride website or call 800.218.2464 for reservations. Dogsledding is a fun activity during winter and spring months in Lake Tahoe. Wilderness Adventure dog sled tours are available 7 days a week. Participants can also browse a list of tour companies in South Lake Tahoe. 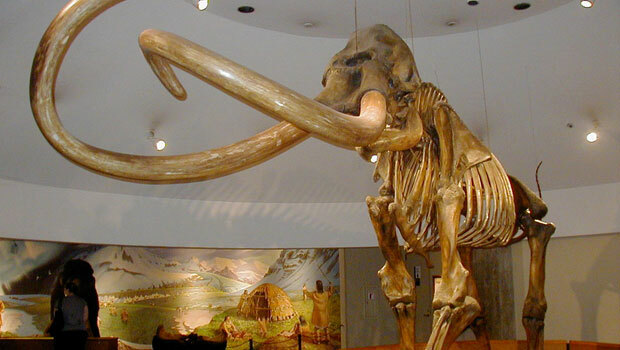 The Page Museum at the La Brea Tarpits displays Ice Age fossils that have been preserved in the nearby asphalt pits. The fossils are between 10,000 to 40,000 years old and include the skeletons of mammoths, mastodons, bison and the American lion. Angels Flight Railway is a short funicular railway in downtown Los Angeles that originally operated in 1901. The railway was restored in the 1990s and is now open every day of the year offering 50 cent rides to visitors. Battleship USS Iowa is a former Navy ship that is now an interactive museum in the Port of Los Angeles. Grauman’s Chinese Theatre is a famous tourist attraction and site of many movie premieres. Tourists love to come to the theater to see the hand and foot imprints of famous celebrities, from the 1920s to today, in the sidewalk outside the theater. Universal Studios Hollywood is home to a theme park, a working movie studio, shops, restaurants and a movie theater. Visitors can take a studio tour, see live action shows and experience many rides and attractions. USS Midway Museum is a former aircraft carrier that now houses restored aircraft, over 60 exhibits and two flight simulators. Self-guided audio tours are available to visitors. The Whaley House Museum is a historical landmark, and according to the Travel Channel, the most haunted house in the United States. Visitors can learn about the house on group tours or self-guided tours of the grounds. The San Diego Zoo is a popular attraction in Balboa Park, and is home to over 3,700 animals. Alcatraz Island is a popular historical site in San Francisco and the site of an abandoned prison. Visitors can take a ferry to the island and tour the former prison, which was also the site of an 18-month occupation by a group called Indians of All Tribes. Fisherman’s Wharf looks over San Francisco Bay and the Golden Gate Bridge, and is near local attractions like restaurants, shops, museums, Ghirardelli Square, the Pier 39 marketplace and the famous Pier 39 sea lions. San Francisco’s Cable Cars are the only moving National Monument in the world and an iconic part of the City by the Bay. They are also a great way to avoid walking up and down the San Francisco hills! 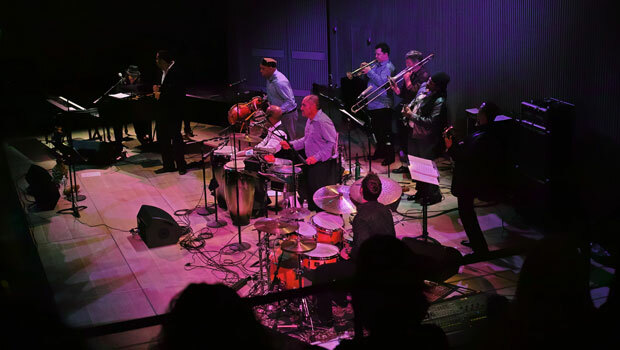 SFJazz Center in San Francisco. Photo by Jun Seita. The state of California has many professional sports teams in major cities like Los Angeles, San Diego, San Francisco and Oakland. Ticketexchangebyticketmaster.com to buy or sell tickets from season ticket holders and fans. StubHub.com for tickets and last-minute deals. College sporting events are a great way to see America's favorite sports in California. Tickets are often cheaper than professional sports games, though some college teams have stronger followings than the pros. Visit a nearby college or university to see a live sporting event and experience an important part of U.S. culture. A list of California college athletic programs is available here. Skiing and snowboarding are the two main winter sports around the Lake Tahoe region at any of the 7 major ski resorts in the area. Winter weather can turn quickly in the Tahoe area, so be sure to bundle up and wear plenty of layers! Ice skating and curling are available at the South Lake Tahoe Ice Arena. The Freeride World Tour comes to Kirkwood Mountain Resort in February for a men’s and women’s skiing and snowboarding competition. L.A. is home to many professional sports teams (see the list above), but also college sports teams like the UCLA Bruins and USC Trojans. Beach volleyball is a popular activity in places like Manhattan Beach, Hermosa Beach, Venice Beach and Santa Monica. Rent a volleyball at a beach concession stand to give the sport a try or watch the professionals play! Multiple year-round pools and aquatic centers are available throughout San Diego. Sportsvite is a website that organizes recreational sports teams in cities across the United States. Search the San Francisco area for open sports teams or leagues in sports like soccer, basketball, baseball and even dodgeball. The San Francisco Recreation & Park Department has many sports programs and facilities for visitors in SF. Recreation centers, aquatic centers, pools and adult sports programs are available throughout the city. Lake Tahoe is home to some more unusual winter activities, like Human Sled Bowling and a Snowball Fight Flash Mob, along with your more well-known activities like cross-country skiing, snowmobiling, snowshoeing, sledding, tubing and dog sledding. Find more about winter activities in Lake Tahoe South. Eldorado National Forest is located to the southwest of Lake Tahoe. Winter sports at Eldorado include skiing, snowboarding, sledding, tubing, cross-country skiing and snowboarding. Camping and cabins are also available throughout Eldorado National Forest. Stanislaus National Forest provides many outdoor activities like swimming, hiking, horseback riding, camping, and skiing and other winter sports. Yosemite National Park is an iconic area of the United States. Best known for its waterfalls, Yosemite has many other attractions within its 1,200 square miles of land. In colder months, visitors enjoy winter trails and winter sports, including downhill and cross-country skiing and snowboarding. During warmer days, visitors can go hiking, horseback riding, rock climbing, biking, swimming and boating. Adventure Mountain is a fun place to try sledding, tubing, snowshoeing and other outdoor winter activities. The Los Angeles area is known for its beaches, so try a surfing lesson with one of these companies: Learn to Surf LA, California Surfing Lessons or Go Surf LA. Runyon Canyon Park is a popular spot for tourists, residents and even some celebrities to walk, jog and hike in Los Angeles. It also has beautiful views of the city, and free yoga is held in the park several times a day. Angeles National Forest is located in Los Angeles County and offers many outdoor activities including biking, camping, hiking, horseback riding, hunting, winter sports and water activities. Santa Monica Mountains has many outdoor activities for visitors, including Native American cultural centers, historical sites, ranches once used for movie sets, and 500 miles of trails for hiking, biking and horseback riding. Outdoor ice skating is available during winter months at the Irvine Spectrum Center. Bikes and Hikes LA offers bike rentals and several eco-friendly outdoor tours of Los Angeles. Coronado Island is a small beach community located across the Coronado Bridge and is home to beaches, water sports, golf courses, pedestrian-friendly main street and other fun outdoor activities. Torrey Pines State Beach and Reserve attracts visitors throughout the year thanks to its miles of beaches, hiking trails and beautiful views. La Jolla, meaning “the Jewel” in Spanish, is located 15 miles from downtown San Diego and has many outdoor activities for residents and visitors, such as snorkeling, kayaking, surfing, scuba diving, fishing and sea cave tours. Golden Gate National Recreation Area is a large urban park made up of many distinct sections. The park has multiple entrances but can often be reached by foot, bike or bus. Visitors can camp or stay at hostels and hotels within the park. Outdoor activities include hiking, biking, beach activities, horseback riding and much more. Mission Creek Park is located in the Mission Bay neighborhood of San Francisco and offers basketball, sand volleyball courts, tennis courts, a dog park, and a small outdoor amphitheatre for events. 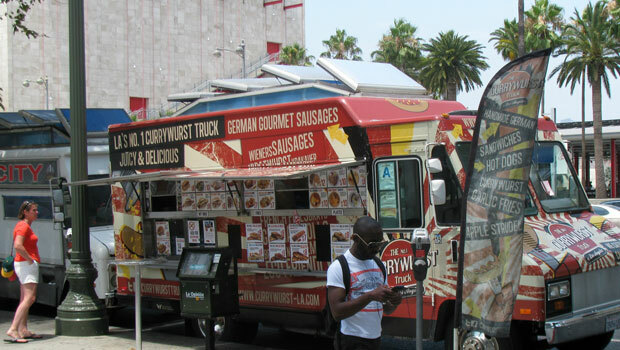 Food trucks in Los Angeles. Photo via Flickr. The local culture of Lake Tahoe is influenced by the healthy lifestyle of coastal Californian communities, but it’s also a mountain town with hearty, buffet-style dining options. Slow Food Lake Tahoe focuses on seasonal and sustainable food in the Lake Tahoe area. The website provides information on local food events, farmers’ markets, farms and producers and local restaurants that support this approach to healthy living. Lake Tahoe Restaurant Week in October allows budget diners to try local California cuisine at Lake Tahoe restaurants at a low price. A database of farmers’ markets in Los Angeles. A food guide to Los Angeles, including neighborhood guides, news, food events and other information. Valhalla Holiday Faire is an annual event in at the Heller Estate in the Valhalla Grand Hall. Local artists and vendors, live music, a school choir and other events and activities are held over the two-day fair in November. North Lake Tahoe SnowFest takes place over ten days and at multiple locations in North Lake Tahoe, including ski resorts and local neighborhoods. Live music, parades, races, theater and concerts are some of the many events during SnowFest. The Tahoe Adventure Film Festival focuses on adventure sports films. See which films are at the festival and buy tickets by visiting the festival website. The SnowGlobe Music Festival is a three-day concert event at the end of December that attracts major acts to South Lake Tahoe. The event is mainly outdoors so dress warmly! The Long Beach Sea Festival is a series of events that take place over 3 months from June to August. Activities include farmers’ markets, arts and cultural events, live music and films, sporting events and more. Make Music Pasadena is a one-day festival in June with hundreds of free performances from local and international artists around Pasadena. The L.A. County Fair is the largest fair in North America and takes place over a month-long period from Wednesdays to Sundays. Activities and events at the fair include shopping, live music and entertainment, parades, carnival rides and attractions. Balboa Park December Nights is a free holiday festival with multicultural events, food, music and entertainment. Participating museums in Balboa Park also offer free admission during the festival. The Adams Avenue Street Fair in September has over 90 live performances on 7 stages, carnival rides and craft and food vendors. The San Diego Film Festival has multiple events, film screenings and educational programs in downtown San Diego and La Jolla. Find a calendar of events in San Diego at the city's tourism website. Fisherman’s Wharf Crab Fest in December marks the beginning of the holiday season with a celebration of a favorite food - crab. Participating restaurants on Fisherman’s Wharf offer up their favorite crab dish and a glass of local wine to visitors. The Great Dickens Christmas Fair at the Cow Palace Exhibition Halls is a great Bay Area Christmas tradition. This fair offers a glimpse into Victorian era Christmas celebrations with various activities, including Victorian Christmas games and caroling. The Fourth of July Celebration at the Pier is a 4th of July celebration with fireworks, live music, entertainment and family activities at Pier 39. The San Francisco Pride Celebration & Parade is a long-running event that celebrates the LGBT community. Many events, live entertainment and exhibits can be found during the last weekend in June, and it is the largest gathering of its kind in the United States. Find more San Francisco events at the San Francisco festival page. Public transportation options can be hit or miss, depending on your location in the United States. Buses are a common transportation option for short and long-term travel in the U.S., while some areas will also have trains, subways and other options. Visit the American Public Transportation Association website for a complete list of public transportation options in your local community. For bus travel in California and the United States, see Greyhound schedules and routes. Amtrak trains serve many communities in California on eight separate train routes. For public transportation in Lake Tahoe, visit Lake Tahoe Transit for bus schedules, airport transportation and more. Lake Tahoe South is also serviced by the BlueGo system, which includes buses, trolleys, ski shuttles and commuter buses to the Carson City and the Carson Valley. Buses and trains are available in the City of Los Angeles and surrounding areas on the Metro system. If you wish to bike in Los Angeles, see Metro’s bike guide. LADOT Transit Services offers bus routes to many downtown L.A. locations, including popular tourist attractions. A Commuter Express bus is also available. Visitors can find public transportation options for nearby counties by visiting the American Public Transportation Association website. San Diego Metropolitan Transit System offers trolley and bus service in San Diego. Northern San Diego is served by the Coaster commuter rail, Sprinter light rail system and Breeze bus system. Find maps, schedules, a trip planner and ticket information from the North County Transit District. Travel between San Diego and Coronado Island via ferry. Between Memorial Day (late May) and Labor Day (early September), visitors can take the Big Bay Shuttle along the bayfront of San Diego for only $1. 511 Transit offers bus, rail, ferry and shuttle information for the Bay Area. Visit www.511.org for schedules and route maps. Muni is the public transportation system for the city of San Francisco and its surrounding areas. Railway lines, bus routes, trolleys and light rail services are available from Muni, and the system also connects to other networks like BART, SamTrans and AC Transit. Biking is a popular form of transportation in San Francisco. See http://www.sfmta.com/getting-around/bicycling and bicycling.511.org for more information on safety, bike trails and maps, and biking in the city. Browse a list of other public transportation options for areas outside San Francisco. California Volunteers is a statewide organization that helps match individuals with volunteer opportunities that match their interests. The Boys and Girls Club helps young people to realize their full potential with after-school programs, mentoring help and other programs. Visit www.bgcnlt.org for the North Lake Tahoe locations and www.bgclt.org for South Lake Tahoe. South Lake Tahoe Family Resource Center offers multiple volunteer opportunities, including working for the bookstore, English tutoring and computer science tutoring. Volunteer Los Angeles helps individuals find volunteering opportunities that match their interests and schedule. L.A. Works connects volunteers of all ages and abilities with organizations in the Los Angeles area. Search for a volunteer project or on-going opportunity by visiting the L.A. Works search page. Volunteer opportunities with the City of San Diego is available on the city website. Work with animals as a volunteer at the Helen Woodward Animal Center. Help out at the San Diego Food Bank on a one-time or ongoing basis. The Volunteer Center helps match volunteers with organizations in need in San Francisco and San Mateo counties for short-term, long-term and one-time volunteer opportunities. The Volunteer Information Center is a website listing volunteer organizations by interest, by organization and by location.